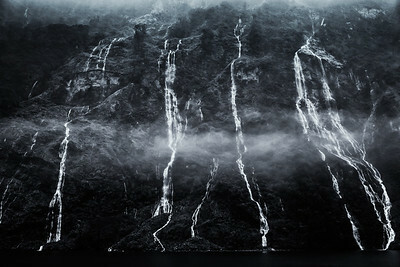 One of many extreme waterfalls witnessed on this cold, rainy, and incredible day in Doubtful Sound. 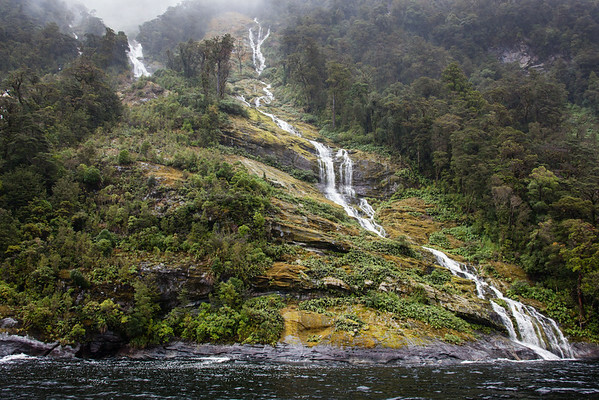 This waterfall, and hundreds more, are in most cases temporary, formed after heavy rains begin to collect and run down the steep sides of the Sound. Water is gathered and speed gained as this runoff water works its way to the cold dark depths of the Sound. 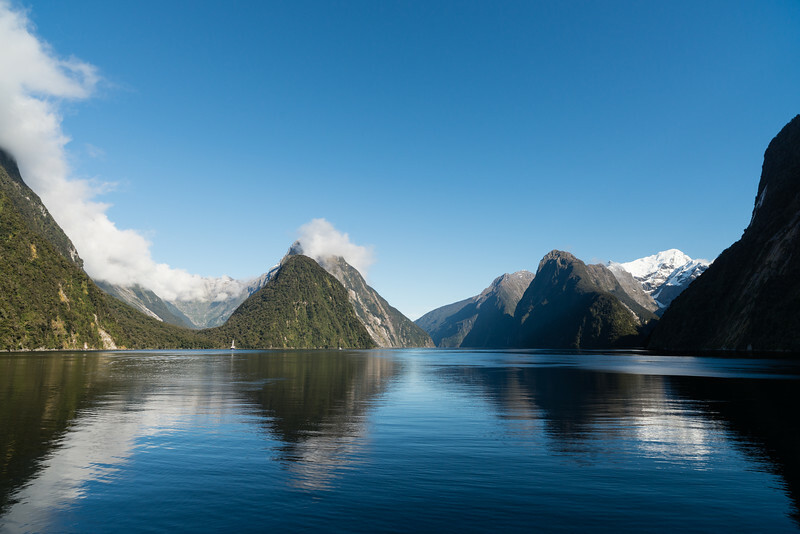 The peacefulness of Milford Sound is amazing when experienced. 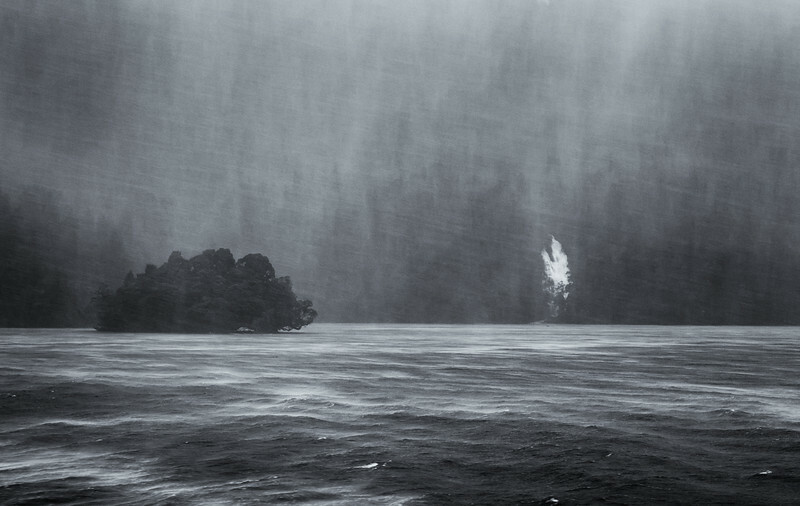 The frequent rain can make it feel wild and untamed, but once the sun comes out and the clouds mostly disappear, the Sound becomes a quite and peaceful place. 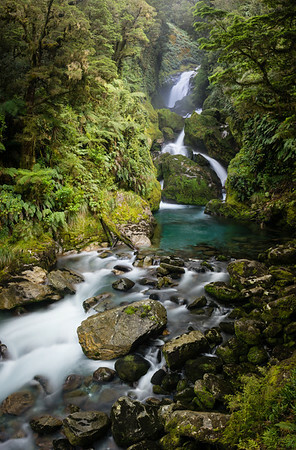 One that showcases New Zealand's natural beauty. 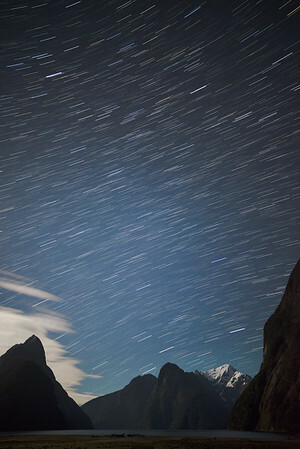 This image was captured early one morning, following my 3 day hike along the Milford Track. We had just set out on a 4 hour cruise in the Sound. Standing on the bow of the boat, I was able to capture the stillness of the water, only somewhat disrupted by another boat that had left shortly before us. Milford Sound is actually a 15 kilometer fjord, that runs in from the Tasman Sea, and is surrounded by near vertical rock that rise 1,200 meters (3,900 feet) from the surface of the water. The Sound is one of New Zealand's most famous tourist destinations. Milford Sound is a truly beautiful place. I happened to be there on a perfectly clear day, which is the exception rather than the rule. And while the blue sky and few puffy white clouds were gorgeous, the true beauty of the sound comes out after heavy rain, when hundreds upon hundreds of waterfalls cascade down the rock walls. 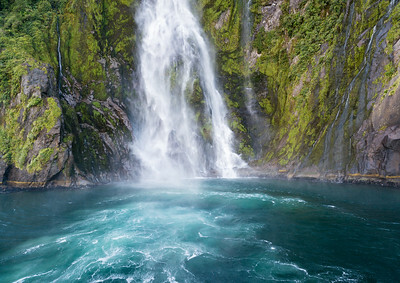 This was one of the few waterfalls I saw during my visit to Milford Sound. It came crashing down the lush, moss covered face of the cliff. Falling hundreds, if not a thousand meters, into the icy cold turquoise waters of the sound, creating a blanket of fine mist that thankfully was not to heavy. Milford Sound is actually a 15 kilometer fjord, that runs in from the Tasman Sea, and is surrounded by near vertical rock that rise 1,200 meters (3,900 feet) from the surface of the water. The Sound is one of New Zealand's most famous tourist destinations. Twelve Second Drop is the view that awaited us after climbing for a couple of hours, and summating Mackinnon Pass along the Milford Track. It snowed for about two minute while I was at the top, but having just arrived I hadn't yet set up my tripod to begin taking images. After taking a few minutes to just enjoy the view, which is simply stunning, I moved very close to the edge (about 3 feet forward of where I placed the tripod) and began composing this image. I wanted to capture the sheer vastness of the scene, the height of the pass, the steepness of the mountains, and the snow line that extends across the range. After soaking in this scene, I continued hiking up the mountain before the train started it's steep descent. 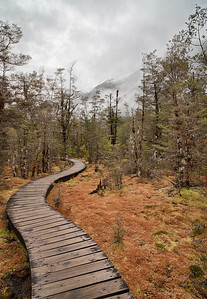 I think what had taken 9 kilometers of track to ascend took only 2.5 km to descend. In fact, if you look at the bottom of the frame just to the left of center you will see a straight line; that is an old airstrip. That's where we stayed that night. I have to say, I've flown into some crazy airports in my day, but I'm not sure I'd want to fly into that one! In case your wondering, the little green sign in the lower left corner of the images says "Danger: Keep clear of cliff edge for your safety." Oh, the risks I take to capture the image. I decided to take a panoramic approach to this image, which is composed of 11 separate slices, all combined in Photoshop. That was really the only way to get the image with the size and scale and detail I wanted. I'm looking forward to having this one printed, as it could easily be three meters.